ANNAPOLIS, MD (October 01, 2017) – When did you last travel along congested I-495, I-95 between Washington DC and Baltimore, or on US 50 toward Annapolis, and notice something missing? Missing are certainly not angry red taillights or flashing blue lights or even cautious amber work lights. Missing is the abundant green, often lush, tropical-looking vegetation crawling over fences and enveloping trees and shrubs. Green overstory trees remain above the cleared leaf-littered ground. More brown is apparent, particularly the brown of dead vines hanging from trees and on noise walls. "What is going on? ", "It looks so much better!" and conversely, "The plants are gone! Now I can see the highway!" and "Are they going to be replaced?" 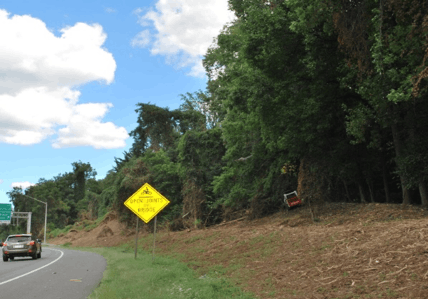 are a few of the public comments received by the Landscape Operations Division of the Office of Environmental Design, Maryland Department of Transportation State Highway Administration (MDOT SHA). What IS going on? Where have all the "flowers" gone? It turns out that not all those "flowers" are beneficial, so the Maryland Invasive Species Council has chosen this topic for the October Invader of the Month. manage surface drainage and control invasive vegetative growth, which could become harmful to desirable vegetation, the surrounding environment, adjacent property, and the public. 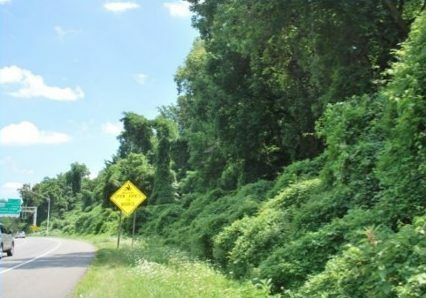 Several years ago, MDOT SHA began planning to achieve its vegetation management goals by addressing the invasion of undesirable plant species, safety concerns, and state and federal directives. To date, the agency has designed eight interstate highway projects, each project divided into two Phases. Phase 1 includes controlling 49 plant species likely to cause economic or environmental harm to the existing ecosystem or to be harmful to humans. After the plants are mechanically removed or treated with herbicides, the rights-of-way are monitored for up to 18 months and retreated for any regrowth. After the initial removal and monitoring periods, Phase 2 begins. During Phase 2, contractors restore invaded habitats by replanting appropriate primarily native vegetation. This revegetation phase is followed by another two years of monitoring and treatment for any regrowth. Once Phases 1 and 2 are completed within six to seven years after commencing, then monitoring of the roadside vegetation will be managed under a separate maintenance contract using standard IRVM principles. Since 2015, MDOT SHA has implemented seven of the eight IRVM interstate projects. Their locations are shown on the map above. The eighth project (PG Co. I-495) is being designed and has not yet been advertised for bidding. Of the seven ongoing projects, six have progressed into the monitoring period of Phase 1. Much remains to accomplish, over time. Ongoing maintenance to control the persistent invasive species and encourage the success of new plantings will be necessary to prevent invasive plant infestation from occurring to this extent again in the future. 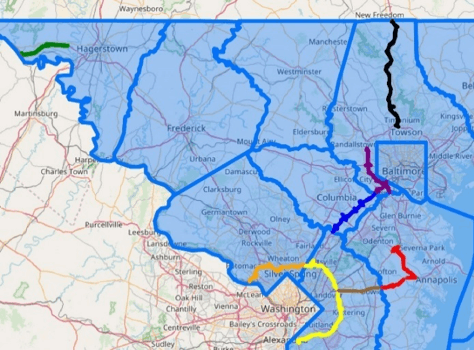 Community coordination will be needed to reduce potential off-property sources of dispersal. Seeds and root fragments are also dispersed by birds, animals, wind, water and relocated soil. Although the "flowers are gone" for now, the treated landscape will never be "free" of invasive species. These invasive and noxious weeds can be managed more economically in the future by carefully managing the landscape with an integrated approach.